The official weigh-ins for “UFC Fight Night 103: Rodriguez vs. Penn” took place Saturday morning in Arizona. The UFC once again conducted an early weigh-ins for this event, so all of the fighters’ official weights have already been registered. However, if you can stream the ceremonial weigh-ins live right here on 5thRound.com starting at 7PM ET/4PM PT. 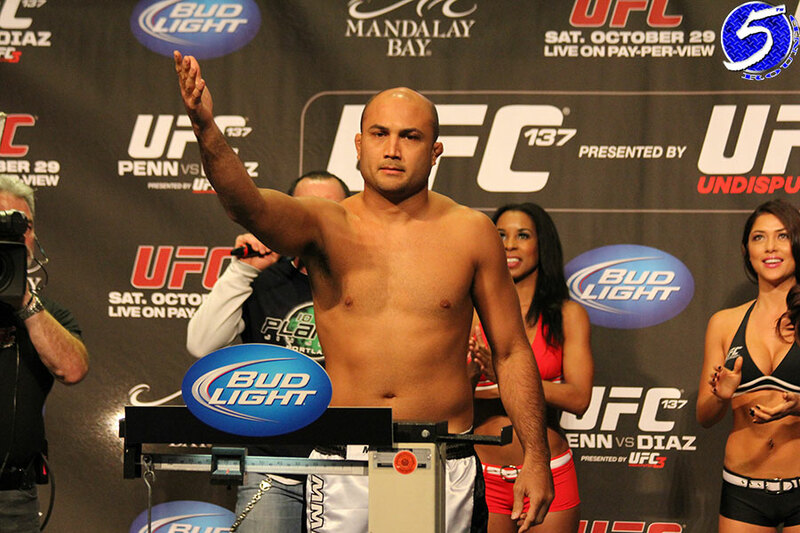 Former UFC lightweight and welterweight champion BJ Penn (pictured) comes out of retirement (AGAIN) to make his UFC featherweight debut against Yair Rodriguez in Sunday’s featured contest. Lightweights Marcin Held and Joe Lauzon meet in the co-main event. Talking Stick Resort Arena in Phoenix hosts tomorrow’s festivities.